My name is Jason. I spent the first few months of 2006 doing research on various haunted locations using several books and rumors as reference. Initially as a hobby, I put together a small team and officially created the “Ghost Investigators” team on October 31, 2006 after being inspired by numerous readings from several books regarding actual hauntings across the country, especially in the New York area. I always had a strong desire to witness an actual spiritual entity, but never had the chance despite having experienced several strange sensations after moving to Yonkers. Going by the name Nightraven, as the team’s founder, I do most of the investigative work by gathering intelligence on alleged hauntings using books, rumors, and the Internet as my guide. I gather useful documents, detailed maps, and secure the equipment necessary to investigate any alleged haunts, and then I lead the team out to do our job making sure to document all pertinent events. I grew up with a fascination for the unknown. I have some knowledge in psychology, the paranormal, and digital photography. I also enjoy writing and am a published author. I have even been inspired to write about my ghost hunting experiences. I attended Lehman College before becoming a NYC police officer in 1991. I worked in Harlem for 23 years, until I retired to pursue my writing career and paranormal investigations full time. Together with my team, I have conducted over 300 investigations. After my nephew, Chris, went on his first investigation, I quickly realized he was the right person to become the team’s first Senior Field Investigator. Chris, aka Shadow, takes ghost investigating as seriously as I do and is just as fearless when it comes to venturing into the unknown. Like myself, Chris is well informed on the paranormal and enjoys reading about it, too. He often feels in tune with his surroundings giving him a better feel for the investigation. He has become my right hand man and helps with carrying the equipment and watching over the team. Aside from myself, he has been on the team longer than everyone else. Jo-Ann is my lovely wife, who I've known since high school. After realizing we had so much in common including an interest in the paranormal, I recruited her into the team and she quickly took to learning how to use much of the equipment. Armed with a major in communications she immediately became the main EVP specialist for the team acquiring EVP recordings in an attempt to communicate with the spirits of the past. She's done so with great success. Her dedication is only outdone by myself. She has accompanied me on more investigations than any other team member. It helps that we are a couple. She also makes a great research assistant. We were married at the historic and haunted Old Dutch Church at Sleepy Hollow, after a few years of dating. Xavier was actually denied entry to the team at first, but I soon realized what an asset he could be and quickly corrected my mistake and asked him to join. I have not regretted the decision. In the time we've known him he has become a very valuable team member, which earned him the position as Technical Crew Chief. He has also become like a member of the family. In fact, the entire team is like a surrogate family. We are great friends, as well as teammates and socialize with one another on a regular basis. The rest of the team consists of other active or reserve investigators, who try to go on as many missions as possible to gain the experience necessary to become as close to experts as possible without having a degree in paranormal studies. There are also some members, who are on reserve status, until the time comes when they are called upon to assist during an investigation. The rest of our technical crew are my good friends, Rich and Danny, along with my cousins, Reuven and Anthony. My dear friend, Mia, focuses mainly on photography, while my awesome cousin, Sarah, assists with collecting EVPs. Our friends, Andrew, Sam, Linda, Devin, Amey, and Terry, all help out as field investigators using random pieces of equipment, as needed. Unfortunately, there are those former team members that have come and gone for various reasons. Just as there are others, who were removed from the team for one reason or another. As team leader, I must sometimes make the hard decisions and do what has to be done in order to maintain the integrity of the team as a whole. I deeply regret losing some members over the years, but it was just their time to move on. Throughout our investigations we make sure to be respectful of the location and any possible spirits that might haunt the area. We do not cause any damage to property in order to gain entry. We do not steal items that do not belong to us. Nor do we display disrespectful or inappropriate behavior during our investigations. We try our best to be professionals. When the team was created it was originally called "Ghost Investigators" for its first couple of years, but sometime after our first website was created the team’s name was officially changed to “Yonkers Ghost Investigators” to establish a specific base of operations. This makes it easier for the public to seek us out for the purpose of conducting investigations. Not all of our team members reside in Yonkers, although it is where our team originated. Business cards were also created acting as a form of advertisement to increase the amount of investigations we could receive. Although, none of the team members are specialists in any fields of the paranormal, they possess the commitment and desire to pursue their goal. Each member utilizes his or her knowledge and skills combined with teamwork to make the best out of every investigation. We might be considered amateurs to some, but we are by far completely dedicated to our cause, which is to prove that ghosts truly do exist. Furthermore, we never run from ghosts. It defeats the purpose of our team's existence. Before retiring from the NYPD, as a police officer, I was trained not to run from danger, but to venture forth into it prepared to face anything that came my way. I've learned to face fear head on. That's just how I run my team. However, we are very careful and take the proper precautions when necessary to avoid illness, injury, or death. The safety of my team always comes first. Some people have asked about the team's motto. I admit it is rather odd and even silly, so I will explain its origin. During our first weekend of doing paranormal investigations, I was with my cousins and former team mates, Christina and Meagan. It was night time and we stood on a hill overlooking St. Joseph's Cemetery. Before proceeding to the lower part of the hill, we noticed a pack of wild dogs entering the cemetery below us. Of course, we were there to find ghosts, not dogs. The presence of the dogs was pointed out, as was their unmistakable hunger and ability to bite. Thus, came the saying of how "Dogs are not ghosts, but they do bite." It marked the end of that particular investigation. Now that you know the tale, don't you wish it remained a mystery? That's what I thought. Next time, don't be so nosy and leave well enough alone! I can tell you an interesting side note regarding dogs. 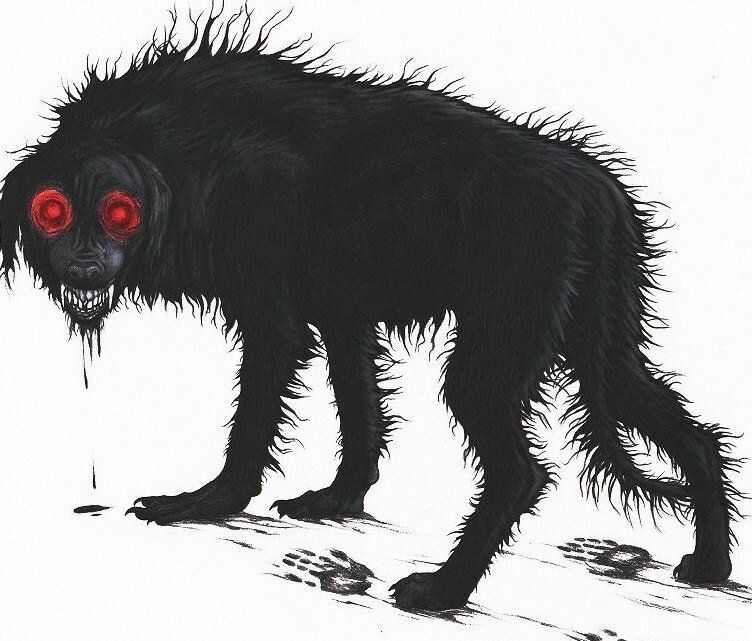 Many locations have mysterious sightings of strange black dogs, which usually means death for someone, if spotted. Sweet Hollow Road on Long Island is one such location. There are also ghost stories about a black dog that haunts Tiffany Field at Nissequogue River State Park, formerly the Kings Park Psychiatric Center. If you find yourself at one of these locations and see a black dog, beware! You could be next!